You probably do. It’s widely regarded as one of the most successful advertising campaigns in history. The campaign was so effective, many people accept it as fact (hint, pork is not white meat). Pork IS red meat, which is obvious to anyone that has handled raw pork – but this statement also has the full endorsement of the United States Government behind it. Impressive! We only point this out because we don’t want white meat (we love you too white meat!) claiming something as delicious as bacon….or, our personal favorite meat snack, prosciutto…….yes, we said it – meat snack! Mmmmm……..prosciutto (wipes drool off keyboard). 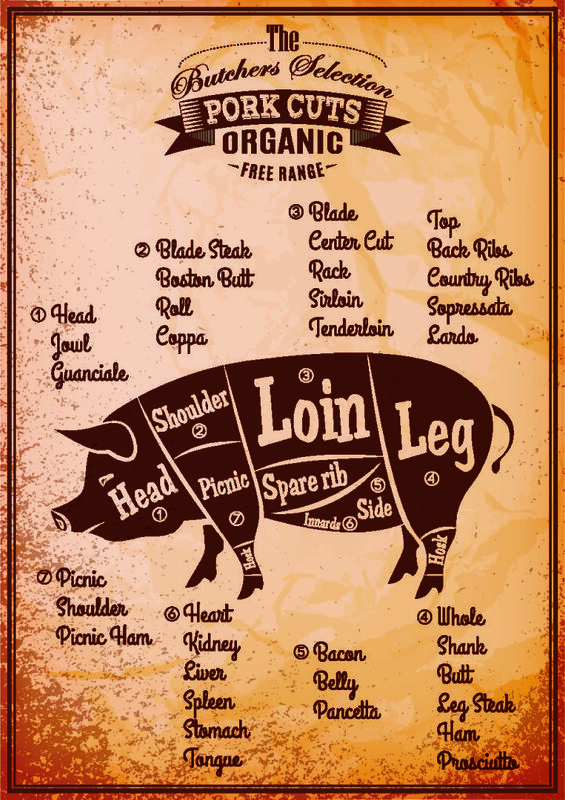 Please be patient with us as we build this into what we hope will become a comprehensive resource for information about cuts of pork and their attributes, preferred cooking methods, recipes, and anything else of use to the legions of red meat lovers. Follow us on our blog or social media and check back here often for regular updates. Click on the picture below to enlarge. Sign-up for our monthly newsletter and receive our Top 5 Tips for free!